A lot happened in my first 16 months! Let me tell you Dexter's story. Dexter gave us concerns from way back when he was the size of a pea and we discovered that he had a single umbilical artery. When mum had her Glucose Tolerance Test at 28 weeks gestation, it came back one point too high. She was referred to an endocrinologist with suspected gestational diabetes. She never did make that appointment. At 31 weeks, Dexter's amniotic fluid began to leak and the very next day he was born by emergency caesarean. The doctors think there may have been an infection but they can't be sure because they gave his mum some antibiotics. injected, to help with his lung development, because he became too stressed and they had to deliver him. But he came out OK. And then he crashed. So we almost lost him that first night. But Dexter is a fighter and he went on to survive pneumonia and anaemia and jaundice. milk scans, swabs, blood work and loads of tests. 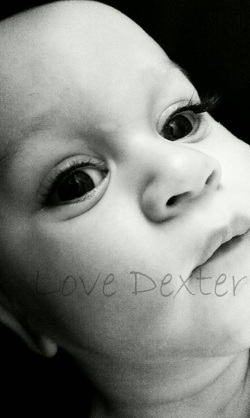 When Dexter was 4 weeks old his routine head ultrasound showed that he had PVL, periventricular leukomalacia. Brain Damage. His mum and dad were told to prepare themselves for severe muscular impairment. So we knew he had cerebral palsy but an official diagnosis couldn't be given. We just had to wait and see what he would and wouldn't be able to do. question the decisions being made about his care. She knew that he would react badly to added calories in his milk, but his carers kept wanting to try so he would put on more weight. So they would try and he would react and have to go back to hourly tube feeds. They found spots on his gastrointestinal tract so they sent him to another hospital for further checks in case he had to have part of his bowel surgically removed. Then, when he was 2 months old and starting to make good progress, he had his first immunisation injections and 12 hours later... stopped breathing. his mum believed that he was developing his sucking reflex and she desperately wanted to try to breast feed him. But he had reflux so his carers wanted to keep him on frequent tube feeds. Bit by bit his mum started to crack with frustration. One of the nurses could see this so he helped her try to breast feed him for the very first time. And it worked. He was able to do it. But still they persisted with the tube feeds. Still, going home seemed like such a long way away. So finally his mum broke and it was decided that Dexter needed to be sent to his local hospital so his mum could feel better. And at his local hospital Dexter thrived. His carers pushed him into growing up. They allowed his mum to breastfeed him on demand during the day. She was put in charge of his care while she was there. And bit by bit, day by day Dexter finally got bigger and better. 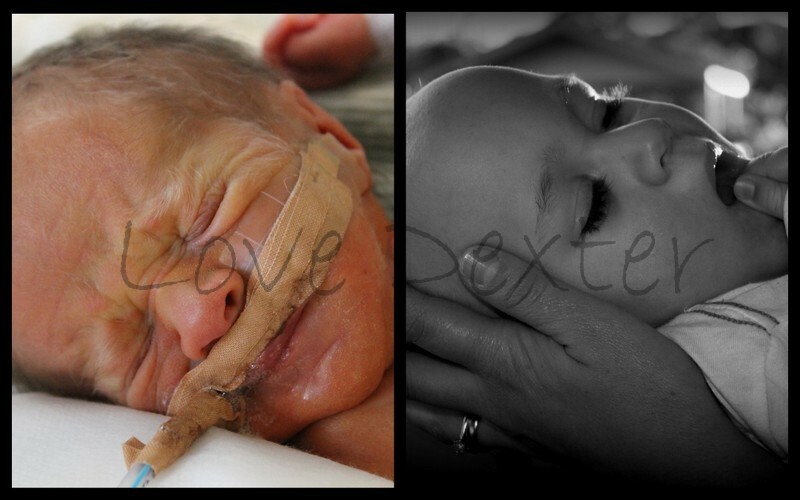 Then when Dexter was 4 months old he had his second lot of immunisation injections. Again he stopped breathing after 12 hours. But this time he wasn't set right back with his feeds. Finally, not long after, he got to go home. He was 122 days old. He was breast feeding on demand day and night. He was breathing on his own. The next week Dexter was back in hospital. A new one. He had an inguinal hernia that required surgical repair. While in recovery he stressed out the nurses and had to be transferred to the ICU. But he recovered quickly and went back home the next day. breathing and we wouldn't know how to react. But he didn't. And he got bigger and better with each passing day. Dexter was a very serious baby. We would play games with him and sing to him and blow raspberries, but never get a response. At the best he would roll his eyes and give us a look that clearly said "Really? Are we doing that again?". But we kept playing games, even though we felt like fools. Now, he smiles at the games. We were right to not give up. Because of his PVL, Dexter attends physiotherapy and occupational therapy. We would do leg and arm exercises with him and he was very good at following our commands. When we said "Up", he would grasp our hands tight and pull his little body from lying to sitting. When we said "Go", he would push his little feet against us and shoot across the floor. He was so determined, he would keep on going, even when he was so tired he could barely move. He was a fighter from the very beginning. We never doubted how much Dexter loved us. Even if he didn't play our games, he held on tight to our fingers. He snuggled in deep to our hugs. And then one day, he smiled. And a couple of weeks later, he smiled again. And then he started to play. He'd even initiate the games. Usually when we were distracted and we'd almost miss his cues. Things were looking up. We were all hopeful for better times to come. Then Dexter got his eyes tested. Cortical visual impairment. His eyes worked fine, but the pathways connecting them to the brain did not. So we had no idea what he could or could not see from one day to the next. From one hour to the next. Some moments he might see perfectly. Some moments he might not see at all. So we used more verbal cues. We gave him more tactile toys. His mum and dad started to wear lots of black and white and lots of big, bold stripes. Then one day, Dexter laughed. And a couple of weeks later he laughed again. And then, sometimes, we could even make him laugh. And he was starting to hold his head high. And he was learning how to sit up. And he caught up to the charts for his size and weight and head circumference... for his actual age. And he started to make more sounds. And he started to roll over. And we hoped that we could put the year that was, behind us. And then Dexter got Cancer.